Jacob Peter Gowy's The Flight of Icarus. 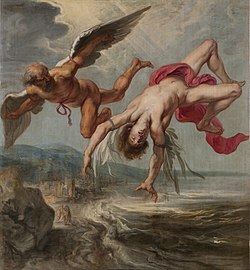 In Greek meethology, Icarus (the Laitin spellin, conventionally adoptit in Inglis; Auncient Greek: Ἴκαρος, Íkaros, Etruscan: Vikare) is the son o the master craftsman Daedalus, the creautor o the Labyrinth. Eften depictit in airt, Icarus an his faither attempt tae escape frae Crete bi means o weengs that his faither constructit frae feathers an wax. Icarus' faither wairns him first o complacency an then o hubris, askin that he flee neither too law nor too heich, sae the sea's dampness wouldna clog his weengs or the sun's heat melt them. Icarus ignored his faither's instructions nae tae flee too close tae the sun, when the wax in his weengs melted an he fell intae the sea. This tragic theme o failur at the haunds o hubris conteens similarities tae that o Phaëthon.